Whew! Lot's of painting this weekend. Well the Alzheimer's benefit is over. Debbie and I arrived there about 12:30 p.m. on Saturday and started our paintings. This is the 4th year for this event and each year it gets better with the way it is run. 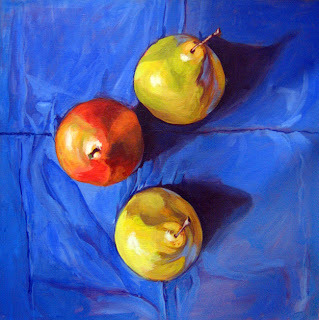 I took a picture of pears (of course...I just love 'em) and printed it out to paint. The painting ended up being 30" x 30". Came out pretty well for doing it all in a day. Debbie did a beautiful sky scene. 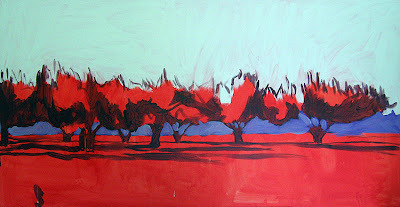 My painting went for $675 and Debbie's went for $325 (give or take $25). We got home a bit after 11 p.m. Our legs were aching from standing on a cement floor all day. You know what the best part was? They fed us! Oh yeah...a well fed artist is a friend for life. Sunday the Thompsons and the Roses went to the 5:00 movie, "Blades of Glory." Just wanted something mindless and hopefully, funny. Well, mindless and funny pretty much covered this movie. I almost spit up at one point. Today, I started a 24" x 48" apple orchard still life. I sketched it out two weeks ago and finally decided to go with acrylics instead of oils. This size can really deplete my supply of oils! Here is the painting in three stages.